Though Emile is still considered the central pedagogical text of the French Enlightenment, a myriad of lesser-known thinkers paved the way for Rousseau's masterpiece. Natasha Gill traces the arc of these thinkers as they sought to reveal the correlation between early childhood experiences and the success or failure of social and political relations, and set the terms for the modern debate about the influence of nature and nurture in individual growth and collective life. 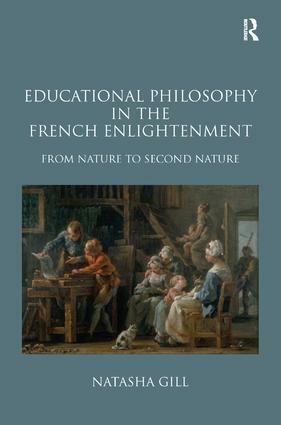 Gill offers a comprehensive analysis of the rich cross-fertilization between educational and philosophical thought in the French Enlightenment. She begins by showing how in Some Thoughts Concerning Education John Locke set the stage for the French debate by transposing key themes from his philosophy into an educational context. Her treatment of the abbé Claude Fleury, the rector of the University of Paris Charles Rollin, and Swiss educator Jean-Pierre de Crousaz illustrates the extent to which early Enlightenment theorists reevaluated childhood and learning methods on the basis of sensationist psychology. Etienne-Gabriel Morelly, usually studied as a marginal thinker in the history of utopian thought, is here revealed as the most important precursor to Rousseau, and the first theorist to claim education as the vehicle through which individual liberation, social harmony and political unity could be achieved. Gill concludes with an analysis of the educational-philosophical dispute between Helvétius and Rousseau, and traces the influence of pedagogical theory on the political debate surrounding the expulsion of the Jesuits in 1762. 'In her thoroughly enjoyable book, Natasha Gill explores the many complexities in Enlightenment educational thought. Between nature and culture, politics and ethics, these philosophers understood that no society could function without an ambitious educational agenda. In this very well-researched study of eighteenth-century pedagogical debates, Natasha Gill demonstrates with impeccable clarity how Enlightenment views on education are still relevant today, and how much we still need them.' Anne Deneys-Tunney, Professor of French at New York University. Natasha Gill is research associate at Barnard College, Columbia University.